He was the son of David William Herringe and Bridget Mary Gray. [S2] Index of BDM records, NSW BDM, Place of Registration: Cowra; Year: 1900; Number: 21458. Birth 1869 John Levett was born in 1869. He was the son of William Levett and Mary Unknown. Marriage 8 November 1893 John was married to Mary Gray, daughter of Peter Gray and Catherine Seery, on Wednesday, 8 November 1893 at Grenfell, NSW, AustraliaG. [S2] Index of BDM records, NSW BDM, Place of Registration: Canterbury; Year of Registration: 1942; Registration Number: 25526. Birth 24 April 1894 John Jerome Levett was born on Tuesday, 24 April 1894 at Iandra, Greenethorpe, NSW, AustraliaG. He was the son of John Levett and Mary Gray. Birth 15 December 1895 Travor David Levett was born on Sunday, 15 December 1895 at Grenfell, NSW, AustraliaG. Birth 25 January 1898 Francis Rex Keith Levett was born on Tuesday, 25 January 1898 at Grenfell, NSW, AustraliaG. Birth 18 February 1900 Alston Elwood Silvester Levett was born on Sunday, 18 February 1900 at Grenfell, NSW, AustraliaG. Birth 22 January 1902 William Henry Dougles Levett was born on Wednesday, 22 January 1902 at Warranderry, NSW, AustraliaG. Birth 6 February 1904 Peter Charles Levett was born on Saturday, 6 February 1904 at Tinpot, NSW, AustraliaG. Birth 22 January 1908 Mary Florence Levett was born on Wednesday, 22 January 1908 at Goonagil, NSW, AustraliaG. She was the daughter of John Levett and Mary Gray. Cecil Burk was the son of John James Burk and Mary Ann Kentwell. She was the daughter of Martin McCarty and Adelaide Elvira Kentwell. Marriage Dulcie was married to John Roach. Death 21 July 1954 Dulcie McCarty died on Wednesday, 21 July 1954. Married Name Her married name was Roach. He was the son of Martin McCarty and Adelaide Elvira Kentwell. Marriage 1 June 1915 Aubrey was married to May Lillian Stedman on Tuesday, 1 June 1915. Death 1960 Aubrey McCarty died in 1960. 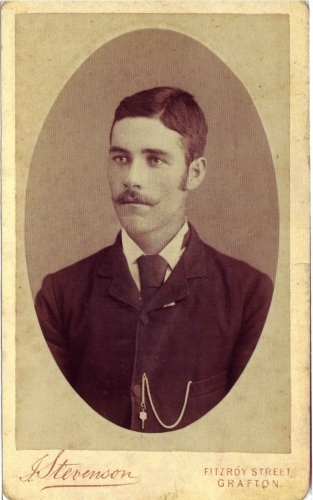 Name Variation 1885 As of 1885, Lynton McCarty was also known as Lynton McCarthy As spelt in the birth entry in the NSW BDM Index. Death 1940 Roland McCarty died in 1940. Birth 29 June 1889 Clara McCarty was born on Saturday, 29 June 1889. Death 30 June 1889 She died on Sunday, 30 June 1889. Birth 1890 Stanley McCarty was born in 1890. Death 1921 Stanley McCarty died in 1921. He was the son of George Perry and Mary Matilda Perry. Death 1950 Albert George Perry died in 1950.